Hipster is the new black. Rejoice, foodies: Fall has finally arrived, and with it comes the greatest flavor combos known in the food universe. 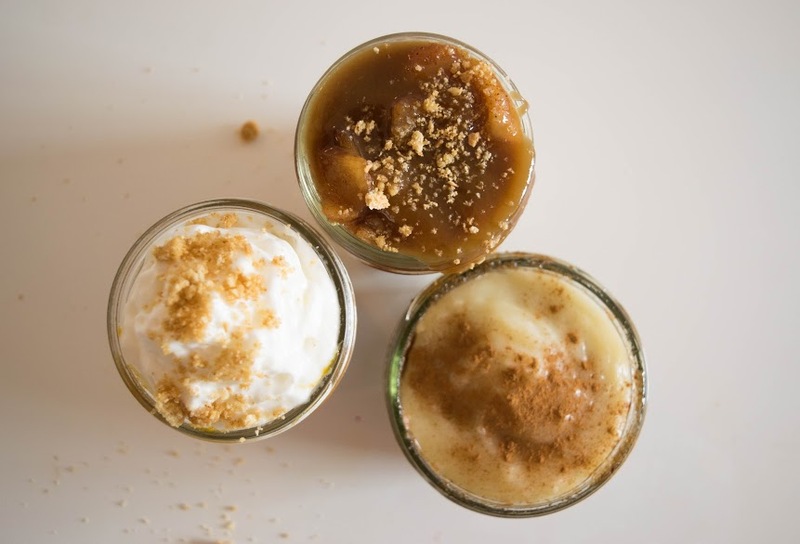 While there’s plenty to be excited about, before you run out to the nearest Starbucks to splurge on a PSL or their new Toasted Graham Latte, try your hand at these easy, delicious and totally adorable single-serving fall treats. The most complex piece of equipment you need is a microwave, so you don’t need to be a fancy chef to satisfy your cravings and impress your roomies. Oh, and the best part — they’re in Mason jars. In a small bowl, combine pumpkin puree, sugar, cinnamon, nutmeg and salt. #SpoonTip: Use the leftover pumpkin puree to make your own DIY PSL. Crush graham crackers in a ziplock bag until the crumbs resemble coarse sand. Combine with melted butter. Spoon a layer of graham cracker crust into the bottom of a Mason jar. Follow with half the pumpkin mixture and then a layer of whipped cream. Repeat step 3 until you reach the top of the jar. Finish with a final layer of whipped cream, garnish with crushed graham crackers and enjoy! In a small bowl, whisk together flour, white sugar, baking powder, cinnamon and nutmeg. Add milk and ½ tablespoon melted butter to the dry mix and combine until smooth. Melt ½ tablespoon butter, brown sugar, maple syrup and cinnamon in the microwave for 20 seconds. Stir until ingredients come together. Spoon half the batter into the bottom of a Mason jar. Layer half cinnamon swirl mixture on top of batter. Repeat with remaining batter and cinnamon swirl. Attempt to create a swirl pattern with the remaining cinnamon swirl mixture for a roll effect. If you can’t, no biggie. Microwave cake for 1 minute. Remove carefully — cake will be HOT. Combine remaining butter, cream cheese, vanilla and powdered sugar in a small bowl until smooth. #SpoonTip: If the consistency of the icing is too thick, microwave mixture for 5 seconds and stir. Top cake with cream cheese icing. Garnish with cinnamon. Devour. Recipe adapted from Kirbie’s Cravings. Peel and dice the apple into small chunks. Place into microwave safe bowl with maple syrup, cinnamon, nutmeg, 1 tablespoon of the sugar and juice of ½ a lemon. Microwave for 3 minutes, let cool. Crush graham crackers in a ziplock bag until the crumbs resemble coarse sand. Combine with 1 tablespoon melted butter. In a small bowl, beat cream cheese, remaining tablespoon white sugar, ¼ teaspoon vanilla and other half of the lemon juice until smooth. Fold in the whipped cream. In a microwave safe bowl, combine 1 tablespoon butter, brown sugar, heavy cream, salt and remaining ¼ teaspoon vanilla. Remove from microwave with caution and stir. Spoon a layer of graham cracker crust into the bottom of a Mason jar. Follow with a layer of the cheesecake mixture, then a layer of apple mixture. Repeat until the top of the jar is nearly reached. Pour caramel sauce over the last layer of apples. Garnish with crushed graham crackers and enjoy. Recipe adapted from Cincy Shopper.